MELVINDALE, Mich. - The Detroit Waza Flo needed to make a statement to the league and they did so in a big way by beating a former MISL team, the Syracuse Silver Knights 8-6 on Saturday night in Melvindale. "The timing to play some creative soccer was necessary to beat Syracuse and shows the ones who doubt us the reality of our competitive organization that we must continue," said Owner/Coach/Player Dominic Scicluna. The league is the Major Arena Soccer League and it is in the inaugural year after combining the Professional Arena Soccer League and the Major Indoor Soccer League into one league. Talk and argument and speculation has been made by many fans, players and even owners about how the former PASL teams will really do against the MISL teams. Many feel that the PASL teams will not make it and should just quit now, including many thinking that of the Detroit Waza Flo team. Not only did Waza Flo beat Syracuse and hold a lead against them the entire game except for one time when there was a tie, they also lost by one goal 9-8 in OT to another MISL team, the Rochester Lansers when Detroit hosted them earlier in the season. The Waza Flo veterans would begin the night off by commanding the field and tallying the first two goals of the night by Worteh Sampson and Miki Djerisilo. Corey Alano netted the third goal of the night from the top of the box. Miki would have an assist as well on the night when he took a set kick next to the wall to the right of the net and found The Count, Costea Decu who slotted it past the keeper to the left back of the net. 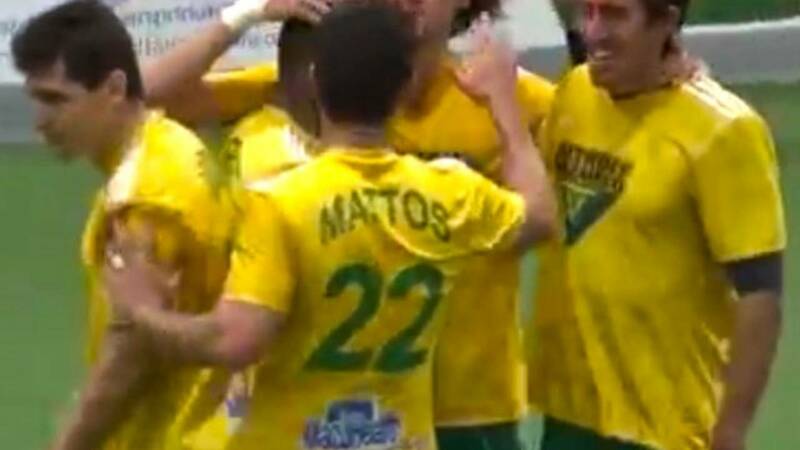 Victor Otieno would assist for Detroit when he found Daniel Mattos who sniped the ball in to add to the scoreboard. With just a minute left in the third, Decu would take the free kick at the line and kick to his left and find Sam Fiore who would take the long shot and BURY it into the back of the net. The Syracuse goalie had a lot of quick decisions to make on the night and Aaron Byrd, from Next Level Training, didn't make it any easier for him when he dribbled up with the ball and as the keeper was watching, Byrd displayed some fancy footwork and diced the ball in past and in for a goal. Syracuse tried to rally back in the last few minutes of the 4th quarter when Neto scored to make it 6-6 but Waza Flo were quick to snag the lead right back when Miki would record his second goal of the night during the power play. His strike would find the upper right 90 of the net despite the keeper diving and getting a hand on it. Detroit had a solid and core group of players for their home game as mentioned in the previous goals but the night also included the return of Zach Bowman, recently signed with Waza Flo, making his first home game debut. What an impression he made with helping set up the next goal of the night. Zach would take the ball down the length of the field in commanding fashion and just as the Syracuse goalie was preparing to defend for a breakaway shot, Bowman slots it to his left to find the foot of Otieno for an open net goal. Detroit (3-4)is now one win behind the first place Baltimore Blast (4-0) and sit iin 3rd place in the Eastern Division tied in wins with 3 a piece with 2nd place Rochester (3-1). Syracuse (1-3), in the same Eastern Division has now fallen to 4th place. The team has a very tough weekend ahead of them with back to back away games on Saturday in St. Louis and on Sunday in Chicago. Scicluna explains the obstacles they will face on top of the grueling schedule, "With our guys coaching the youth, it makes it very difficult to have the same line up on the road as we do at home. This will be a challenging weekend for us playing two talented teams back to back and changing the line up from game to game. We are going to give our best effort to make our fans proud." The next home game with be on Saturday, December 20th when Chicago heads to face Detroit Waza Flo at the Melvindale Civic Center at 7pm. This nonstop brilliant soccer action can be also enjoyed by fans being able to give back once again at the game on December 20th by donating a nonperishable food item to Gleaners. Each item with a child receive $4 off the ticket price and each with an adult gets $5 off in discounted prices. It's the season for giving. Detroit Metro soccer fans, come participate in giving and enjoying watching the Detroit Waza Flo give a win to the fans that night in professional indoor MASL action. Detroit Waza Flo verse Chicago Mustangs Saturday, December 20th at 7pm at Melvindale Civic Arena (4300 S Dearborn St, Melvindale, MI 48122). (Reduced prices if one donation item per person is brought in) Tickets prices are Adult $12 and Children ages 3-12 years $8 can be purchased online.